Uses:- Eposis Injection - Erythropoietin, or EPO, is a glycoprotein hormone that controls erythropoiesis, or red blood cell production. 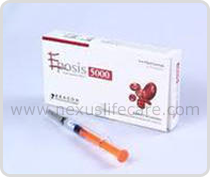 Eposis Injection is a cytokine for erythrocyte (red blood cell) precursors in the bone marrow. Also called hematopoietin or hemopoietin, Eposis Injection is produced by the peritubular capillary endothelial cells in the kidney, and is the hormone that regulates red blood cell production.